Everybody can help somebody—even you! "I used to spend a lotta time worryin' that I was different from other people . . .
Little Denver grew up very poor, and he didn’t get to go to school. As time passed, Denver decided to hop a train to the big city for a different life. But that life was difficult, and Denver spent many years as a homeless man. But God showed His love through two people who were very different from Denver. 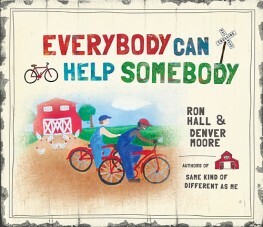 Based on Same Kind of Different As Me, the emotional tale of Denver Moore’s life story, this unique children’s book includes Denver’s original art. Parents and children alike will be moved by this powerful story and will never forget the unexpected and life-changing things that can happen when we help somebody. One word.. Remarkable! I loved this book. I have not read the other by the same author but you better believe it is on my to be read list now! The illustrations are unique and almost child like in design. The story begins with Denver's early years during the Great Depression. His family worked as share croppers in Louisiana. They lived in a shack without electric or water. The book states, "They were as poor as they could be.". This book is the story of Denver, of his upbringing in a time of poorness and desolation and how he got to where he was. This is a very touching story sharing with each of us, that though we may want to save the world and rescue everyone.. we can't. We each however can do something to help somebody. Fantastic story for kids and adults alike! I think the best way to encourage kids is by example. Practice what you preach. I am always giving little reminders to my kiddos. All day long. And I love what Carl said. Practice what you preach. "Practice what you preach" is excellent advice. When you see a way to help out, lend a hand yourself and talk to your kids about it. This can be small like opening a door for a handsful mom, taking a cart back to the store, or taking food to a sick neighbor. There are many ways to help so talk to your kids about it and about how blessed you are as a family. Find a volunteer opportunity you can do together so you can set an example of service to others. I think the best way to encourage is by example. Kids are more likely to do a desired behavior if you do it as well. We have a local food bank and clothing bank right around the corner. All of my kids go with me when I have helped and they end up helping me. They know what it is to help someone in need and I am so proud they love to do it too.